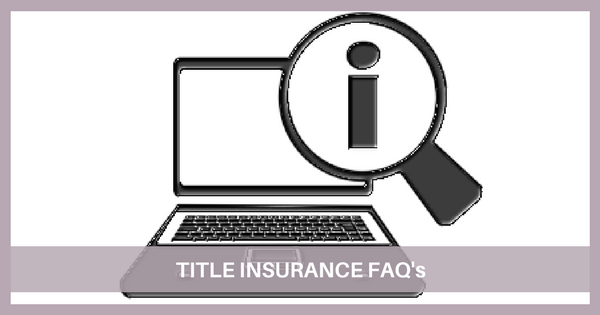 To help you understand how title insurance protects you and your property, here are common questions and answers regarding Title Insurance. Title is your right to own or use your property. Title also establishes limitations, if any, to those rights. A title search is one of the first steps in the title process. The purpose of a title search is to uncover issues that could limit your ownership rights to the property. If an issue is discovered, most of the time, the Title Company will take care of it without you even having to worry. If you're buying real estate, title insurance is an insurance policy that protects your investment and property ownership rights. There are two different types of title insurance: an owner's policy and a lender's policy. Owner's title insurance protects your property from possible future legal claims against your ownership rights of the property. The owner's policy also covers potential legal fees and/or court costs for claims covered by the policy. Sometimes, defects can come up after the title search. Under the owner's title insurance policy, the buyer is protected against certain undiscovered errors in the title. The one-time fee for an owner’s title insurance is low relative to the value of the property. A typical title insurance policy costs around 0.5% of the property price. Your owner's insurance policy lasts as long as you, and possibly your heirs, own the property. Closing is the final step in executing a real estate transaction. The process allows the transfer of ownership to occur. Once completed, the buyer gets the keys and the seller gets paid. The American Land Title Association helps educate home buyers and sellers about title insurance so you can protect your property rights. You can also contact us to learn more about title insurance and the home closing process.